← Koerner Concert Hall – Esprit Orchestra, Amadeus Choir, Nexus, Hillary Hahn, Pierre Laurent Aimard, and the Edward Westin Concert Hall. I had read the article below and had put it aside intending to reference it at sometime in the future. In fact I forgot about it until I received an e-mail a few days ago from my friend, pianist, composer and percussionist Bill Brennan. He was referring me to a website where I could hear recordings by the Original Dixie Land Jazz Band, known to aficionados as simply the O D J B. It was this reference that reminded me of Mr. Harris’s article. My brother collected recordings of Dixieland bands and he was particularly fond of the O D J B. Therefore, from an early age I had heard this group and Louis Armstrong’s Hot Five, Hot Seven and other noteworthy Dixie Land bands of the 20s. Mr. Harris’s article also mentions Pauline Oliveros. I first met Pauline at the New Hampshire Music Festival in 1962. She introduced me to “structured improvisations” and we had a grand time arguing about the credibility of this-and-that. Years later Pauline conceived a work for Nexus and she and I kept in touch sporadically for many years. Who generally began to say, JAZZ is “America’s Premier Art Form”? This question was posted to a jazz research message board I subscribe to on April 19, the day after this year’s annual extortion to Aunt Iris was due. I remembered that part of the hard-earned cash my wife and I had to pay this year goes to the salary of Representative John Conyers, who authored a Congressional bill (HR 57) in 1987 which designated jazz “a rare and valuable national American treasure to which we should devote our attention, support and resources to make certain it is preserved, understood and promulgated.” (I’m just doing my civic duty as a good citizen.) But I also remembered that Conyers’s good friend, Dr. Billy Taylor, called jazz “America’s classical music” long before HR 57. According to the sources on the message board Dizzy Gillespie said jazz is “our native art form” (although he didn’t specify any nationality in the term “our”) in 1957, an unnamed contributor to Harper’s described “talk of jazz as a native art-form” in 1950, and a 1946 issue of the New Republic calls jazz “the only original American art form.” Another magazine, Art Hodes’s The Jazz Record, insists that jazz is “America’s first wholly native art form” (ca. 1943) and in 1944 RCA Victor issued a set of records claiming to be “presenting jazz music as an American art form worthy of study.” Earlier citations are included: “Naturally, there have clustered together little groups of serious European thinkers to make the same discovery that Americans have made, that Jazz is a great art form” (Paul Whiteman, Time, 1926); “as far as America is concerned it (jazz) is actually our characteristic expression” (Gilbert Seldes, The Seven Lively Arts, 1924); and a mention of a book written by Japanese author, Kamesuke Shioiri, in 1929 (the book is untranslated, but the person posting has offered to supply a PDF copy of it to anyone who contacts him through the message board). The quotes from the earlier dates are significant in that this was a minority opinion among the cultural elite at the time. There was much heated debate about whether or not jazz was even music, much less art. Some, and mostly classical conductors, saw jazz as having artistic merit, but most saw it as an abomination that would lead to the corruption of society, probably because of its purported origins in African American culture. But that was the dilemma, if Dvořák were to be taken seriously (and enough time and money had been invested in his residency at The National Conservatory that he had to be taken seriously), then any truly original American music had to be steeped in African American musical aesthetics (as well as Native American ones). My point is that by the time the music being called jazz was being accepted by the masses, it was played by an elite group of ethnically diverse performers. Why the work of Scott Joplin isn’t considered an original American art form while the drivel that Paul Whiteman was calling jazz is, escapes me (unless one takes into account the tastes of most American highbrow music lovers, then it all comes into perspective). It seems that as long as there has been a music called jazz, someone has been trying to call it an American art form and someone else has poo-poohed the attempt. But improvisation (and I am blogging about improvised music) wasn’t the main thrust of jazz of the ’10s, ’20s, or even the ’30s. It really wasn’t until the late 1940s and ’50s that this became considered an indispensable salient feature. It seems that as improvisation became more important to jazz performance, the musical result became more questionable in terms of authenticity. I almost want to thank Ken Burns for his arbitrary demarcation that essentially launched the 2nd New Orleans School in New York City and took jazz away from the improvisers and performing musicians and put it into the hands of corporate-friendly composers and academicians. Except that a lot of really great music is marginalized so as not to question certain ideological and political forces that lean toward global hegemony and must, by their tenets and methodology, stifle improvisation. For example, the salient feature of early jazz, more so than improvisation, was the use of extended techniques, especially those resulting in unorthodox timbres. When James Reese Europe brought his African American military ragtime band to France in 1918, the local musicians couldn’t believe the sounds that the Harlem Hellfighters were producing with their instruments. Trumpets growled and wah-ed, trombones slided and belched, saxophones bent notes and played without vibrato. 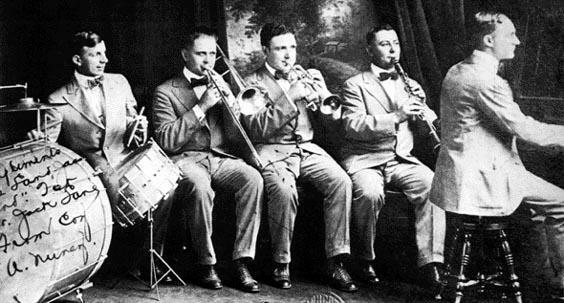 The first “official” jazz recording in 1917 of the Original Dixieland Jass Band included “Livery Stable Blues,” where the instruments imitated the sounds of barnyard animals. Over the decades, an indispensable aspect of the artistry of jazz performance was mastery of a set of extended techniques that could become part of one’s “voice.” Johnny Hodges’s swooping melodies, Roy Eldridge’s growls, Walter Page’s slap bass. Listen to John Coltrane and ask yourself if his sound and technique would have any place in the classical saxophone world, and then ask yourself who was the better saxophonist, Marcel Mule or John Coltrane. Without answering that directly, one thing is clear, Coltrane was original—and he was original in a field of original saxophonists. It doesn’t take a very discerning ear to hear the difference between Coltrane, Wayne Shorter, Dewey Redman, Warne Marsh, Stan Getz, or Dexter Gordon. Each took an unorthodox way of playing and milked it into a personal voice. With the advent of the jazz repertory orchestra and ensembles, that is becoming lost. More and more, the “big names” of jazz sound less and less original in their use of extended techniques. The soprano saxophone playing of multi-instrumentalist Joe McPhee is like nothing anyone else does, but you rarely hear of him outside of Trio X or his work with Pauline Oliveros. The others who were breaking ground in the late ’70s and ’80s as part of the “Downtown Sound” are pretty much left out of the new jazz paradigm, although Jazz At Lincoln Center owes their souls to them. They continue to be the real carriers of the flame and, as such, will probably have to self-produce and play door gigs in small venues in Brooklyn or Harlem or the Lower East Side between an every dwindling amount of European tours to keep their vital, important, and original music going. Which is good for me, since I can’t afford the charge on San Juan Hill!